Join your fellow members of the York County Democratic Party and very special guests for Spring Forward, the party’s annual fundraiser. Held at a new location in downtown Rock Hill with ample parking, Spring Forward is the place to see your friends, meet special guests, and raise the money that helps the party run all year long. Visit https://secure.actblue.com/donate/sf2019 today to reserve your spot at the party and to help support our mission all year long! The York County Democratic Forum will meet Every Month on the First Tuesday at the Towne Tavern located at 2000 Highway 160West in Fort Mill. The meeting will begin at 6pm but you are encouraged to come earlier 5-5:15PM to enjoy dinner and get a seat. Speakers will be announced before each meeting. In lieu of the increasing attendance numbers, we at Towne Tavern are utilizing a “satellite” parking lot for our entire Staff and guests in Suite 160. We are asking the guests of such large events to please cooperate and park in the designated satellite parking lot. The satellite parking lot is part of the distribution center adjacent to our site. There will be a white sign at the entrance of the driveway to denote the lot. The lot is very well lit and our plaza can be reached by using the sidewalks parallel to Highway 160. We appreciate your cooperation and look forward to seeing you all on Tuesday evening. Thank you. 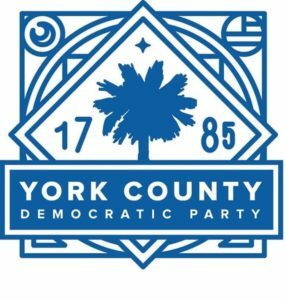 If you are looking for a way to support your local York County Democratic Party, please consider joining the 120 Club. If you’re already a member, consider adding $5 to your monthly donation. For as little as $10 a month, you can give YCDP $120 a year. That money goes to the reoccurring costs of the headquarters, events, and support for our candidates.